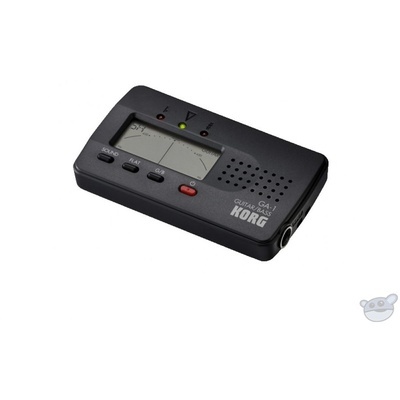 Product #31868 | SKU KOR-GA1 | 0.0 (no ratings yet) Thanks for your rating! Don’t let the price fool you! Don’t let the price fool you! The affordable GA-1 Guitar Tuner / Bass Tuner is an excellent choice for any guitarist or bass player. The handy Tilt-Slit design provides easy viewing; Auto Power Off preserves battery life. Low-power consumption design allows an amazing 100 hours (approximate) of continuous battery life (A4 continuous input, Meter mode, zinc-carbon batteries). * Even if the pitch is within the detection range, detection may not be possible for instrumental sounds that contain a large number of overtones or have a rapid decay. Quinta Flat tuning mode -- a world-wide first! The GA-1’s Quinta Flat Tuning mode supports the lowered tunings used in heavy metal styles to give more weight to the sound. Until now, dedicated guitar tuners have supported a maximum of only four semitones below standard pitch, but the GA-1 gives you five steps of flatted tuning, extending as far as five semitones below standard pitch, and supporting even super-long scale guitars that are five frets longer than conventional guitars. Even if the pitch is within the detection range, detection may not be possible for instrumental sounds that contain a large number of overtones or have a rapid decay.